I love Christmas. To me, it really is the most wonderful time of the year; people are smiling, connecting with loved ones, and celebrating the season, together. It’s fitting then, that to continue the merriment – many would scour for a special gift to give their loved ones. Being that I’m an image consultant – based and raised in Burlington, I can attest to the fact that I spend most of my days inside of stores; seeing a wide variety of special treats that many shops here have to offer. While the malls inside of the city have great things to offer, the real charm and hidden treasures lay within the boutiques and small businesses of Burlington. In the spirit of making the holiday shopping season a little bit easier – I’ve highlighted some of my favourite gifts for the holiday season that will be found in some of Burlington’s most treasured stores. For me, the holidays begin in your home – hanging stockings, wreaths, and decorating the tree. One destination that had me consistently gasping over the stunning array of decorations and ornaments is, Centro. Filled with one-of-a-kind pieces to fill any tree or adorn any home – this store can keep you captivated for hours (I would know, I’m often tempted). Being that I’m sucker for Christmas ornaments, I was instantly drawn to some of the beautiful glass and metallic pieces. The best part about Centro? The pricing is extremely reasonable with pieces beginning as low as $4.00. There are also a wide variety of decorations and fun pieces for kids, too. My favourites for the holidays were a silver 3D snowflake and gold glass ornament for the tree. While decorating your home – you always want to dance around to some great music and make the experience fun! For music lovers in your life, head to Loony Tunes on Brant Street. This small cove has a vast array of music that carries new and old – both in songs and in the media it is played on. If you like cds – they have you covered -- or, if you are a vintage lover like myself, vinyl records may be more your speed. Whether you’re looking for single discs, records, tapes or full collections – this is one music destination you want to check out. My gift of choice for the holiday season? The full DOORS or Beatles collection in vinyl. In my books, nothing beats that sound. I have to admit, I have a terrible sweet tooth. If there is sugar or chocolate nearby, I’ll be sure to find it. Knowing that there are are many self confessed chocoholics like myself out there – I know sweets can often be a great gift giving idea. Christy’s Gourmet Gifts has numerous things I’d like to take home with me. If the aroma of the store alone doesn’t have you weak in the knees, the homemade chocolates and sweets will. Two goodies that stood out and needed mention in this guide are the Beer and Chardonnay wine brittle. Booze and chocolate mixed into one mouth watering dessert? Who can resist that this time of year? During the cold winter months, there is nothing I enjoy better than curling up on the couch and reading a great book. 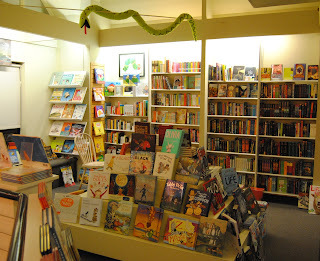 While there are many major chains you could go to, to me, the experience of losing yourself in a cozy book nook while browsing for that next great read is much more appealing. A Different Drummer is somewhere every bookworm (or those looking on behalf of one) needs to venture. Cozy, peaceful, and full of hundreds of books – this 3-storey boutique has not only every genre of book available (including a floor dedicated to kids) – but a massive selection, also. My holiday gift choice from there? The Last Lion by William Manchester and Paul Reid – the last book in a series chronicling the life of Winston Churchill. 1) The slim clutch – they ‘re not only practical for your cards while out, but, come in beautiful patterns -- making them a beautiful statement accessory (and only $22!) that will match any outfit. 2) Booty Shapers –- they are the perfect stocking stuffers for any woman that has boots in her closet. Easy to inflate, these inflatable shapers will slip into any boot and not only contour to fit your footwear properly, but will help maintain the integrity of it, also. Perfect for leather knee high boots! If you walk to the back of Joelle’s, you’ll walk directly into a stylish store designed just for men. Filled with clothing appropriate for business or play, watches, cufflinks, hats, and more– this store is a one stop shop for the men folk. There is even a flat screen up on the wall to ensure the boys don’t miss out on their favourite sport while shopping -- does it get any better for them? 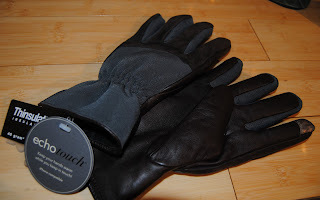 For 2012, my holiday gift choice in Jeff’s shop were the Echo Touch gloves. Coming in a sleek black and grey, these gloves keep your hands warm while also allowing you to play on your smartphone. Have an iPhone or any touch sensitive product? No, problem. These Echo Touch gloves are also compatible with them all. For the active individual on your gift list, Mountain Equipment Co-op is the place you need to visit. Filled with goodies for biking, camping, running, canoeing, and more – this store will allow anyone heading outdoors to check off everything on their ‘to-do list’. What caught my eye in this store was the Chaos Tubular Headware. 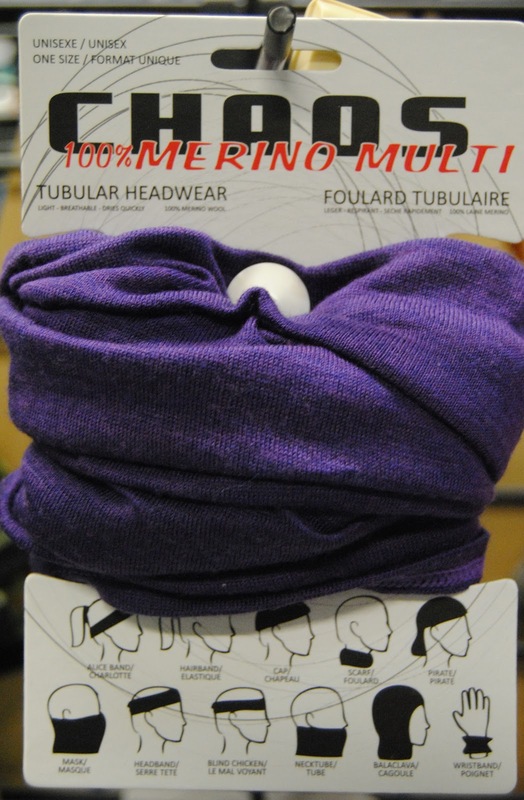 Useful for men or women, this piece (found in an array of colours), can be used in a variety of ways such as; a balaclava, headband, mask, wristband, scarf, cap, necktube, hair tie…and the list goes on. It’s a great gift – that can be used in any activity to keep you warm. Rattle & Stroll – a boutique dedicated to baby essentials, had me on ‘cuteness overload’. Filled with toys, clothing, décor, and furniture – you’ll be surprised at the amount of, “Ooooo’s” and “awes” that will escape your lips whilst browsing the store. Since it’s important to keep the little munchkins in your life bundled up during the winter months (while making them look adorable, of course, at the same time) – I had no choice but to showcase these handmade daisy baby hats. Priced at only $28.99, how can you resist the urge to put these on any infant’s head? For the four-legged furry friends in our life – there is only one store that I go to; Bark and Fitz. Filled with wholesome food, treats, clothing, bedding, and toys – this boutique is perfect for any cat or dog lover out there. If your furry best friend likes to head outdoors and is in need of a jacket, the Canadian pooch coats are a great choice. Offered in several colours and of great quality to keep your pet warm – you can be sure the gift recipient will receive a slobbery, happy smile when being taken for a walk. If toys for your pet or someone else’s are what you’d prefer – there are numerous holiday stuffed toys for cats and dogs available, also. So, after you’ve written your gift list, and checked it twice – head out to Burlington’s boutiques. Grab a coffee to sip on and browse the charming stores. This will not only ensure continued sanity throughout the season, but will also have everyone raving about the gifts you gave them. Everyone will not only be inquiring where you picked up the fabulous goodies, but will also be secretly hoping to be picked by you for Secret Santa next year. Christie is an International Image Consultant, Editor, and expert shopper that helps women find their own signature style. She is the Editor­in-Chief for FashionTranslated.com. 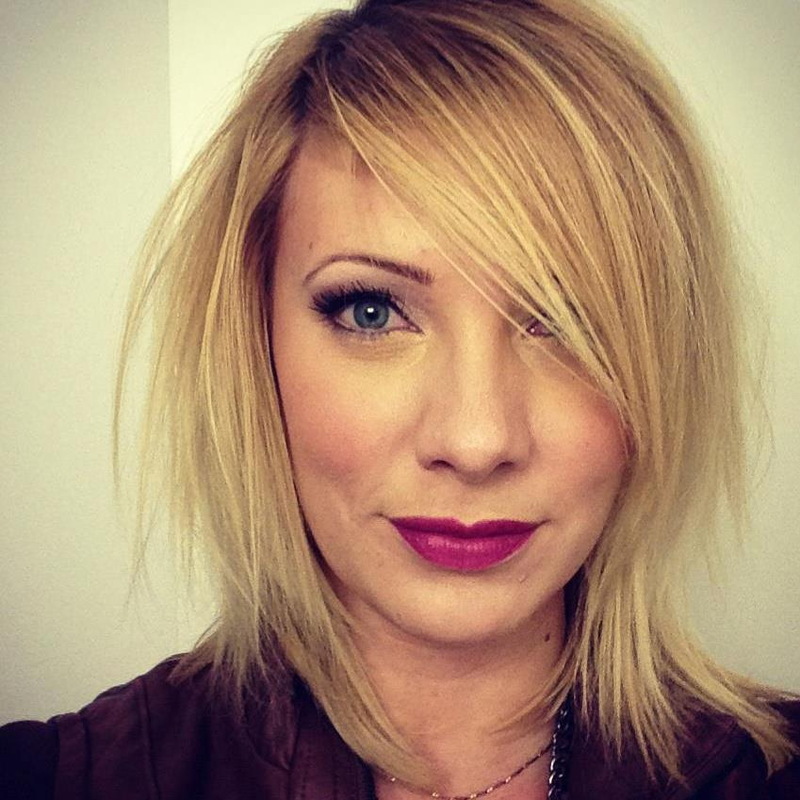 She and her company, PersonalPower Image are regularly featured in the media and press such as CosmoTV, Chatelaine Magaine, Huffington Post, Lucky Magazine, and more. Having delivered hundreds of lectures and interviews across North America on style and fashion, and seen even more closets -- she is the go to fashion and style expert.